Sculpteo is one of the top 3D printing service bureaus in the world, and as such, it’s safe to say that we stay busy following their activities, from offering new and numerous 3D file formats to delving into the educational arena to new materials and information about the industry as well. Sculpteo’s services and offered tools are vast—but expanding even further with the very recent announcement that they will be among several partners, but will be the first and only global 3D print platform to use CLIP (Continuous Liquid Interface Production Technology), offered by Carbon (formerly Carbon 3D), the printer that uses a breakthrough printing method to enable continual production of commercial quality parts. Sculpteo is also currently the only online 3D print service to own a printer of this type in its San Leandro facility in California, along with releasing very important new resin materials that will be available March 1st. We’ve all been waiting for this technology to emerge further since news of it burst onto the scene with quite a splash, alerting the world that Carbon had indeed made a true breakthrough, offering 3D printing technology that could foreseeably operate at speeds up to 100x greater than what we are used to. Harnessing the power of light and oxygen to cure a photosensitive resin, this new technology goes far beyond what we are used to with SLA. Higher speeds are achieved as the element of layering is removed from the equation. This changes the game quite a bit, obviously, with the use of oxygen as the catalyst. Parts are able to be fabricated in a single unit, as the resin used is targeted by a projected light source that passes through a special window that is transparent to light and permeable to oxygen. The light polymerizes the resin and the oxygen inhibits that process, so by controlling the oxygen flux through the window, the process creates a ‘dead zone,’ which is a resulting thin layer of uncured resin between the window and the object. While we’ve all been perched on our seats (for quite a while now!) waiting to see what more would come of CLIP technology, it’s not a surprise to hear that the dynamic Sculpteo is the only 3D printing service bureau in their area to own one of these Carbon printers. The technology was introduced simultaneously at TED 2015 and to the scientific community on the cover of Science, March 2015. Carbon has so far received $141 million in funding. And as a Carbon partner, Sculpteo will also be unveiling a line of new resins—from rigid to flexible—compatible with the Carbon 3D printer. While the printing technology itself is enormously exciting, along with it comes a variety of materials able to respond to ‘key engineering requirements,’ offering extreme strength as well as the temperature resistance associated with a nylon-glass composite. 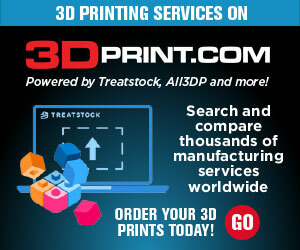 “This new technology and the revolutionary materials offered are taking 3D printing to a new level. The gap between product design and manufacturing has never been shorter; these speeds are game-changing…” said Clément Moreau, CEO, who co-founded Sculpteo in 2009 with Eric Carreel, where they offer on-demand 3D printing of individual products as well as short-run manufacturing. They have 45 materials, colours and finishes available, plus superior file analysis and repair. CIDEAS is one of four partners to be using CLIP technology from Carbon. CIDEAS, founded in 1998, is a full-service, additive manufacturing, and 3D printing center. They are headquartered in Crystal Lake, IL and house over 30 in-house machines, with production capabilities including that of not only CLIP, but also SLA, SLS, FDM, PolyJet, urethane casting, and part finishing. CIDEAS was also the first service bureau to join Carbon’s early customer program. The Technology House, also to be a new partner of Carbon’s, serves a wide range of businesses to include medical, aerospace, defense, industrial, energy and consumer products markets. Their production teams offer expertise in blending 3D printing, cast urethane, plastic injection molding, and multi-axis CNC machining. In offering the technology that’s driving all these new materials and programs, Carbon is undoubtedly working to accelerate the future of 3D printing—literally–and it looks as if they will be greatly succeeding. Carbon is creating the truly advanced technology of today that is going to make a big difference for the future as well, and the names listed in this article show who is getting on board first. Have you heard of this technology previously? Discuss in the CLIP 3D Printing Partners forum over at 3DPB.com.